Watch this space for additional gatherings and seasonal celebrations hosted by 3 Fold Balance or join the facebook group to receive event details & notifications. No spam, just opportunities. A place to ask questions, receive online practice supports, resources, and share your shamanic experiences. https://www.facebook.com/groups/3FoldBalance/ These events often fill to capacity quickly - pre-purchase tickets to ensure your spot. Here it is! 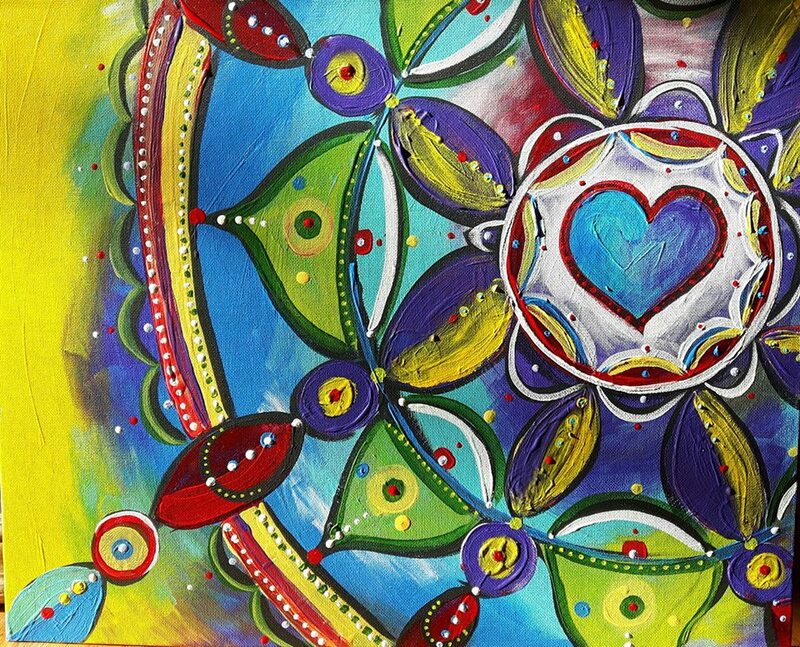 Many have asked to paint mandalas with me and step into the spirit lead process that can be a balm to our soul. Our paintings are not only a medicinal process, but are also a powerful form of energy work. We step softly into our own personal ceremony and infuse our paintings as they are created; every time we look at them afterward our conscious & subconscious minds lend more attention to the embodied experience of what we create. While open to all, those with some experience with acrylic paint (how paint "moves", brush control, etc) will find an easier time. Our focus will be on the creation/manifestation process itself, which opens and strengthens our connection to our intuition, nudges from spirit, and divine inspiration. By constantly stepping out of our left-brain need to control or make "good art" you will be supported with step by step encouragement and prompts to notice how our painting mirrors our day-to-day living experiences, and how we dream our lives into being. ~ If you have a medicine bundle, sacred item, talisman, pouch, or crystals you are already working with - please bring! ~ Nibbles to share. This is a long gathering and we want to stay topped up and comfortable! The yellow door at the top of the stairs before you get to the yoga studio. Please send a separate email with password to accept. Due to the need to purchase supplies, unfortunately late registrants can not be accepted. Drums have a rich history of use during shamanic journey work, sound/vibration healing, dance medicine, trance states, rites of passage, and for ceremonial use of all kinds. When we create our own sacred tools, we are able to cultivate a deep relationship of reciprocity. Our time together will be held in sacred ceremonial space with each participant making offerings to the land we gather on. Time will be taken for sainning (smoke clearing) and with reverence we will journey to the animal & tree who gifted us use of hide and hoop, and then again to the spirit your drum for insights pertaining to your ways of working together. ~ We will talk of various drum uses, best care practices, and decoration tips will be shared should that be in your future process. ~ I will speak to continuing to deepen your relationship and honouring through their individual attunement and awakening ceremonies to be done on your own in the weeks following. ~ I will also share information on drum mallet creation - which will also be done on your own, or you might wish to partner up with someone from the group. 8 members made it through a rigorous year of spiritual training and diving deep into their personal healing. To honour the natural inner wisdom within each member and empower the connection to their feminine medicines, red drums were made before our Completion Ceremony. A second year to deepen medicinal shamanic techniques is undertaken by some SLI alumni and includes a 3 day Vision Quest plus a stay at The Sanctuary. Here are a few of our moments during this challenging, beautiful, and deeply profound experience. 2017 was our 6th annual Summer Solstice fire ceremony & camp out! About 30 of us gathered in Upper Squamish Valley for a beautiful ceremony, heart activation, feast, and camp out. Our animal visitors included Bear, Hummingbird, Butterfly, Swallow and Mouse! A beautiful wisdomshop is forming with medicine people from different lineages coming together to share the similarities and differences in how we set space, cast circles, and call in the directions in preparation for sacred work. We will also share smudging practices and beliefs. The aim of this evening is to foster your personal connection to spirit in ways that really resonate with you, to become more comfortable with these protective & honouring rituals, and to facilitate connection while encouraging diversity. "I approached the sound of drumming as dusk settled in over the sandy beach, picking my way through icy water and smooth stones I achieved my goal, seated before me the women chanting softly and in rhythmic, hypnotic bliss. Then Juliette spoke, comforting and guided us to explore our own meaning of the solstice, the fire burning, the ebbing heat of the sand under feet. She wove her wonderful knowledgeable magic through each of us, and in the perfect setting we each opened up to share and experience our own unique thoughts. It was a full and richly rewarding event, I would recommend indulging your soul in her gifts as often as you can." ~ Susan G.